Enjoy Stunning views from this 12th floor, north and west facing unit at Denver's beloved Mid-Century Modern Cherry Creek Tower Condos!!! This amazing opportunity offers a One Bedroom with One Bathroom. Showcases Floor to Ceiling Windows with Breathtaking North Facing Mountain and City Views, Pride of Ownership Throughout, Updated bathroom with jetted tub. Tiled kitchen counters and stainless steel appliances. The Building is meticulously maintained and has a fully renovated common area with Modern Amenities. 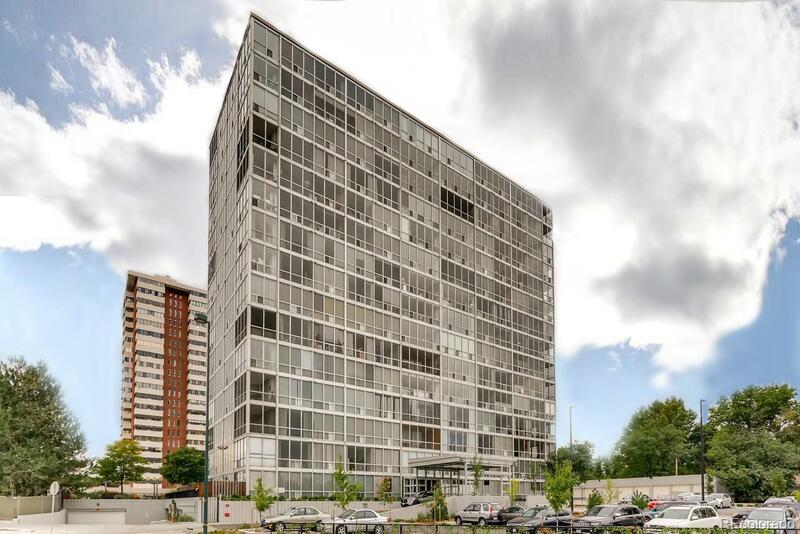 Includes On-Site Fitness Area, Swimming Pool, Large Terrace with BBQ Area, Guest Suite, and New Roof, Deeded Covered Parking Space #84/Storage Unit #S-3. Pets are allowed as long as they can be registered as a service or companionship animal. Steele Street Bridge Allows Easy Access to CC Bike Path, CC Mall, and Award Winning Dining and Shopping in Cherry Creek North!! !